NOVEMBER 21, 2013 – The Tecate SCORE Baja 1000 held its 46th annual motorsport competition across the Baja peninsula and over a most treacherous journey through the wild deserts and into the untamed mystique of Northern Mexico. Known as the world’s most arduous non-stop off road racing event, the Baja 1000 demands every ounce of courage that one could muster just to even take the green flag and start down the course at speed. Braver than most,BJ Baldwin, dominated Baja in a King Shock equipped Chevrolet Silverado Trophy Truck and crossed the finish line during the early hours of Saturday morning on November 16, 2013 to claim the overall victory. Baldwin completed the 883 mile event in just over 18 hours 36 minutes at an average speed of 47.5 MPH. The winners of the top buggy divisions; Damien Jefferies of Class 1 and Brad Wilson in Class 10 also utilized King Off Road Racing Shocks to conquer the grueling terrain and earn the top finishing positions. In all, 10 different class-winning vehicles were outfitted with King Shocks. A notable statistic that outlines results in an event where only 125 out of 251 participants (just 49.8 percent of the field) were able to even complete the course within the designated set time of competition. The super high-grade materials and quality construction used to manufacture all King Shocks suspension components makes all the difference where durability is the fundamental aspect in keeping your race moving forward. Maintaining an effort worthy of winning requires intense focus, physical agility and mental strength. Lasting through nearly a thousand miles of non-stop punishment will drain the most competent athlete’s endurance and willpower. A plush ride designed and finely tuned by experienced experts will allow the drivers to conserve precious energy while racing over the endless miles of rough uneven terrain. In an exceptional feat of determination, combined with concentrated preparation, BJ Baldwin earned this latest victory by completing the entire event as a solo driver. “The truck can only take so much and your body can only take so much mentally and physically,” Baldwin illustrated the enormous challenge of iron manning the race. “… I just put this thing on the chip and let it eat up the bumps.” BJ has now captured 2 consecutive Baja 1000 wins, back-to-back SCORE Trophy Truck Championships, and the overall World Championship, all equipped with King Shocks. 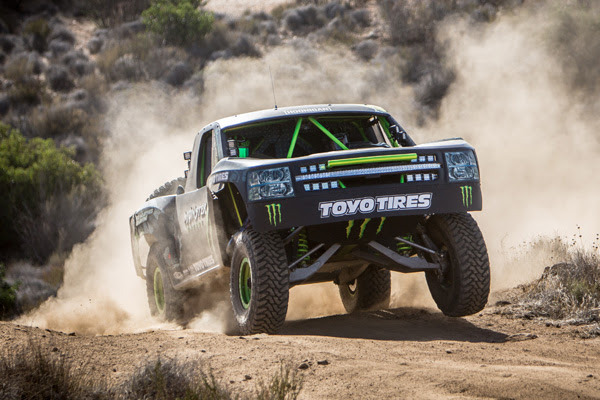 The 2014 Baja 1000 marked a milestone turning point in this historic events legacy. Roger Norman, SCORE-International’s new promoter setup a challenging loop course that no doubt preludes a new chapter of where off road desert racing is headed. 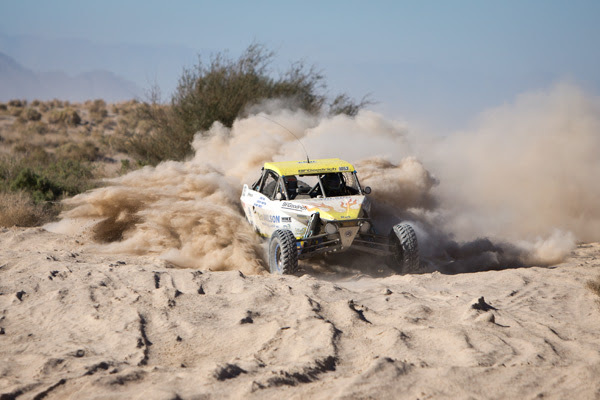 Starting in Ensenada, winding through rocky trails, opening up into the rough open desert, picking routes through endless silt beds, and ending back in Ensenada 883 miles later; Racing in Baja is now more difficult than ever. Preparing for an event like this means selecting your equipment and setting up your vehicles is now more important and crucial to performance. Your choice is made easy by recognizing that many previous winners typically share a common trait, King Shocks. Race to dominate. Race to win. Race with King Shocks.